There’s nothing like planning a BBQ only to discover that you have been using it so much lately that you are out of Gas, and there are no BBQ Rocks for the Weber either. That was me the other night, but not to worry, Mr 8 recently bought me an electric grill plate, which he really intended for his pancakes, but I have since found to have many, many other uses. Like cooking enough Chicken Kebabs in one go to feed our family of 8. These Kebabs were a huge hit with the Kids and went perfectly with with this Lemon Parsley Rice and Grilled Marinated Vegetables. Place all of the ingredients except for the chicken strips into a large Zip-Lock Bag. Seal the bag and swish the ingredients around to form your marinade. Open the bag and add your strips of chicken. Swish it all around until the chicken is completely coated in the marinade. Seal the bag, expelling as much air as you can and sit the bag in a large dish or tray and place it in the fridge for at least an hour until needed. I like to turn the bag over any time I think of it to make sure the chicken is evenly marinated. 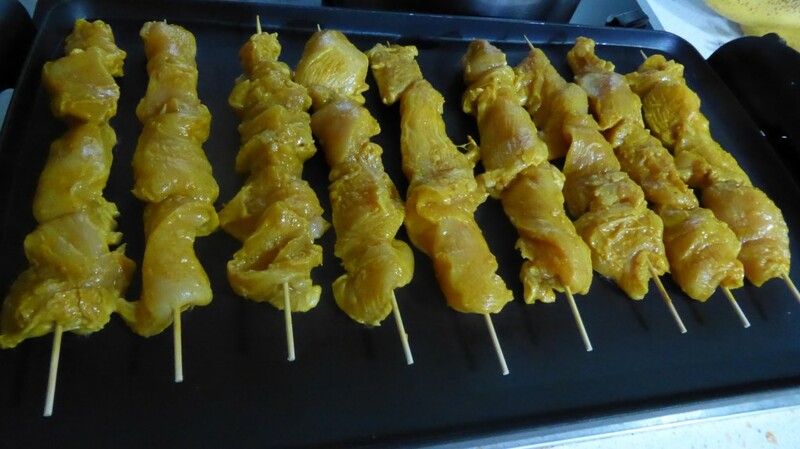 When you are ready to BBQ, thread your chicken strips onto your Kebab Skewers and discard the marinade. Cook on your Grill until the chicken is cooked through.